This week the US Supreme Court hears a case concerning the constitutionality of partisan gerrymandering in Maryland. Examining current, past, and alternative electoral maps, Alex Keena, Michael Latner, Anthony J. McGann, and Charles Anthony Smith find that by making districts more competitive, some redistricting plans can actually work against one party or the other. Only the introduction of proportional representation with multi-member districts, they argue, would mean a truly fair electoral system for Maryland. On March 28, the US Supreme Court will hear its second case this session concerning the constitutionality of partisan gerrymandering, and the capacity of scientific standards to detect violations of constitutional rights. 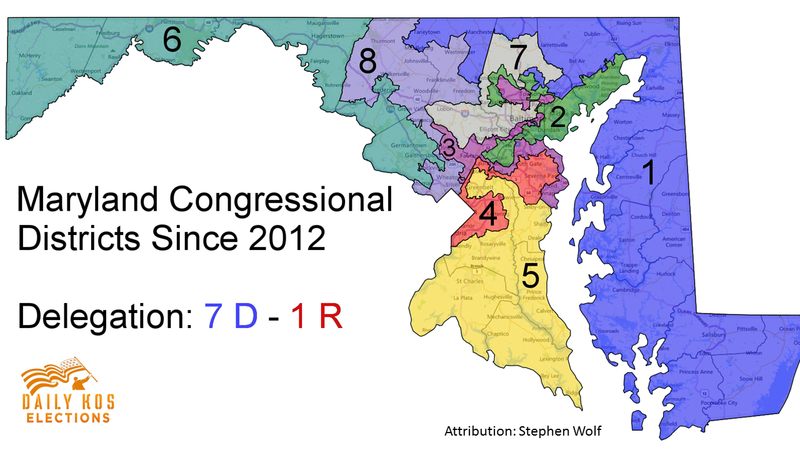 Voters in Maryland’s 6th Congressional district claim that, as a result of the 2011 redistricting plan designed by the state legislature’s Democratic majority and then-Democratic governor, their once reliably GOP district was geographically transformed into a Democratic seat. 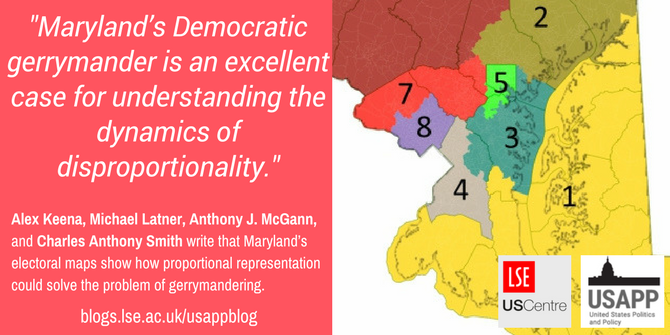 The nature of Maryland’s gerrymander is distinct because of the way that Republicans have to be distributed in order for Democrats to gain partisan advantage. It is a great example for demonstrating the different ways that deviations between vote and seat shares can be created. 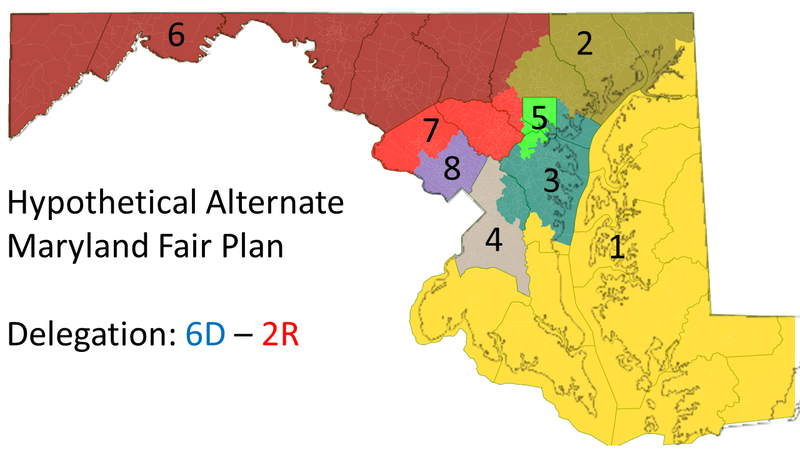 The current Maryland plan, pictured below in a map designed by Stephen Wolf at Daily Kos, is clearly a Democratic gerrymander, as a variety of statistical estimates (bias at 50 percent, efficiency gap, mean-median gap, etc.) have demonstrated that Republicans asymmetrically waste more votes in the conversion of votes to seats. In a Democratic-leaning state with eight Congressional seats, what was a 25 percent seat share for Republicans in 2010 was reduced to a 13 percent seat share, a single seat, in 2012, even though the GOP typically earns around one third of the statewide vote. It is seemingly ironic then, by at least one measure of asymmetry, partisan bias at 50 percent share, the previous plan was actually more asymmetric. Indeed, the pattern of discrimination that emerges shows that Democrats gained their “extra” seat, not by packing more Republicans into the GOP-held 1st district, but by making districts more competitive overall. Alternate map simulations show how this is possible. By distinguishing the different ways that statewide vote shares are distorted into inefficient seat shares for a party, it is easy to see how a more competitive map can actually produce a more distorted outcome. Consider that the only conversion of votes to seats that treats each voter perfectly equally is exact proportional representation (PR), that is, when the percentage of votes for a party yields the exact same percentage of seats. Any deviation from perfect PR yields “disproportionality” (which is measured here using the Gallagher Index). 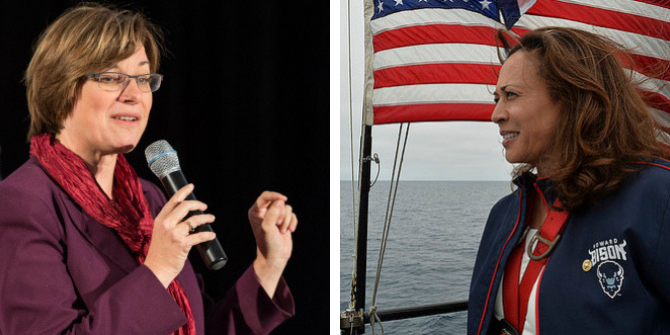 There are various reasons why all of the world’s electoral systems generate some disproportionality, but our Congressional elections generate two powerful and distinct varieties. One way is through partisan bias (the first column of Table 1), meaning where two parties receive 50 percent of a statewide vote, but the gerrymandering party receives a bonus seat share. If there is insignificant bias, voters in both parties are treated equally. This specific form of bias is measured using an estimation technique developed by Gary King and Andrew Gelman, and it has the advantage of separating out another way that single-seat, winner-take-all elections generate disproportionality, through the “responsiveness” of the system, which reflects how much of a seat bonus a winning party gets for every percentage point in vote share that it gains. In addition to the pre-2012 and current plans, we need to look at three alternate plans based on the same electoral data, average Congressional and 2012 Presidential vote returns. The first alternate maximizes Democratic Party advantage even beyond the current plan, illustrating how key responsiveness is for Democrats. Next, a hypothetical fair plan shows that it is possible to reduce both bias and responsiveness simultaneously, but that disproportionality against the minority party is inevitable. That is, unless an alternate, proportional (PR) electoral system is used to account for minority vote shares within districts, as shown with the last alternate plan. Voting outcomes change dramatically from the districting plan that was used from 2002-2010 (data are averages from those elections) and the current plan, used since 2012. Overall disproportionality between the two plans has more than doubled from 11.2 to 24.5. But notice that bias, which is positive when favoring Democrats and negative when favoring Republicans, is actually reduced. If Republicans made up a majority of the electorate, as they did when they elected Governor Larry Hogan in 2015, their Congressional candidates would actually do better under the current plan, though with 50 percent of the vote they still receive 14 percent fewer seats on average compared to Democrats. The increased responsiveness, which roughly doubles to 3.9 percent, greatly advantages the majority Democrats by amplifying the magnitude of bias. The biggest geographic advantage was gained where Democrats changed the 6th district boundaries to include more voters from metropolitan Washington D.C. This shifted the 6th from a GOP-leaning to a Democratic-leaning district, but it also made the adjacent 8th and other districts more competitive, if still safely Democratic. The current plan is more of a “dispersal” gerrymander than a “packing” gerrymander. 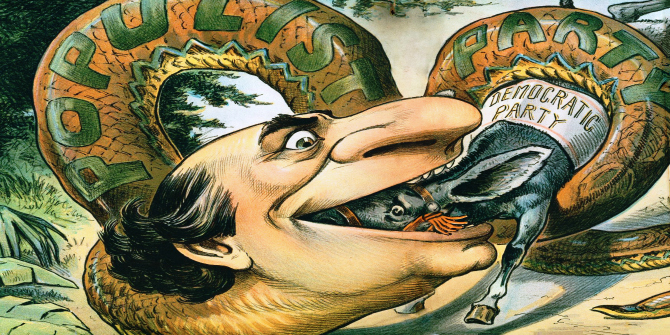 Under the old plan, Republicans were packed into two “sink” districts where they had two seats, but even with a massive wave in Republican support, they would not gain any more seats. Today, Republicans in Northwest Maryland are more efficiently distributed, but the responsiveness of the system works against them. Because one party always wins 100 percent of seats in single-seat districts, the “perfect” plan for a majority party is to make every district a microcosm of the state, yielding it 100 percent of the seats. Stephen Wolf shows how this strategy is actually possible in Maryland, where there is a surplus of Democratic voters to distribute, and they could actually capture all eight Democratic seats, using a Chicago-style pizzamander to slice up metropolitan D.C. and Baltimore. In this scenario, bias virtually disappears. 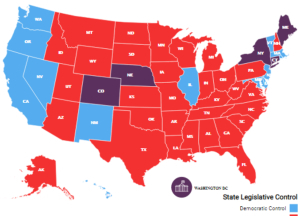 This is an unbiased plan, in the sense that either party earning over 60 percent of the vote (the Democratic average) could capture all eight seats. Dispersal plans maximize the principle of “winner-take-all” by maximizing responsiveness, yielding a disproportionate seat bonus to whichever party wins the most votes. That is to say, disproportionality generated by responsiveness is a feature, not a bug, of our single-seat system, though it can be minimized by drawing safe seats for both parties (an incumbent protection plan). Whatever the constitutional justification, the current gerrymander is justiciable, and the remedy is fairly straightforward. We were able to generate a plan using the same electoral data from the previous maps, with no significant bias, and responsiveness comparable to pre-2012 levels. Republicans would have a safe seat in the 6th, and there are two competitive seats in the 1st and 2nd, one Democratic-leaning, the other GOP-leaning. This plan also includes two African-American majority districts, and is much more respectful of county boundaries. This is about as fair a plan as Republicans can expect, without moving to a more proportional districting system that would minimize the impact of being the minority party in most districts. 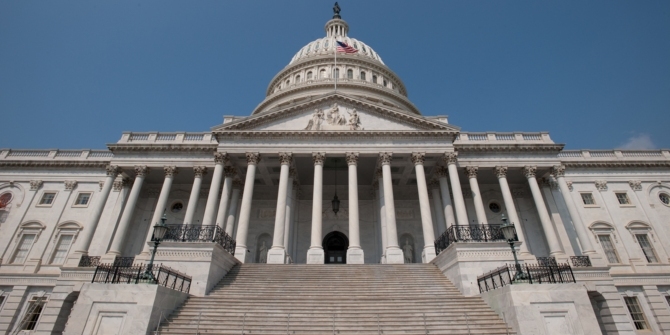 Multi-seat districts are currently prohibited for Congress, but there is a bill in committee, the Fair Representation Act, that would facilitate multi-seat Congressional districts. Several states previously elected their Congressional delegates using multi-seat districts, though they used discriminatory plurality formulas. Several state legislatures, including Maryland, still use multi-seat districts to elect some members. 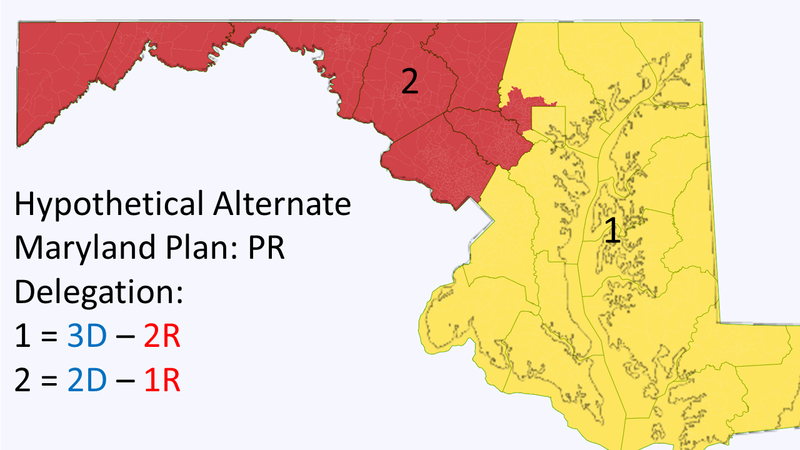 The last alternate, PR plan, divides Maryland into two districts, with district one containing five seats, and district two containing the other three seats. 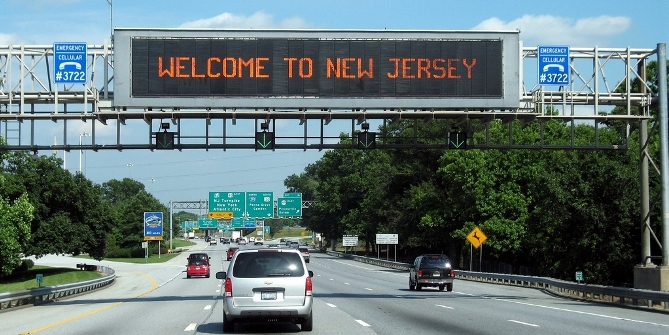 The larger district includes the more heavily populated region of the state. Using a neutral electoral formula for seat allocation (one that does not provide a bonus to the largest party), this system would assure two seats to Republicans (assuming two party competition), and would nearly assure them a third seat in the larger district, for a total of 38 percent of the seats, about as proportional as you can get (responsiveness is trickier to estimate for multi-seat districts and is excluded from the table, but it is insignificant, given the low disproportionality). Moreover, every voter contributes to their party’s seat share. The votes of rural Democrats and urban Republicans are as valuable as anyone else’s, and racial groups don’t need to be packed into districts to have an equal and effective voice in choosing representatives. Maryland’s Democratic gerrymander is an excellent case for understanding the dynamics of disproportionality. 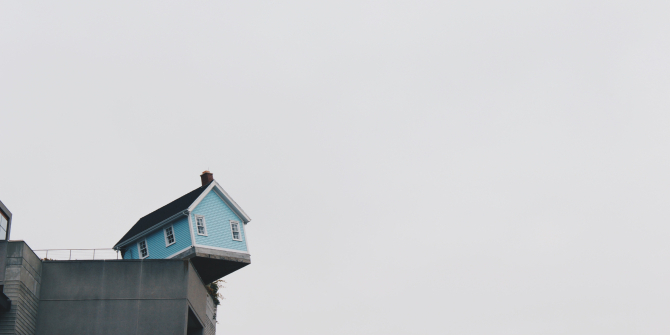 Still, it is highly unlikely that a majority of Supreme Court Justices will recognize the direct connection between individual political equality and greater proportionality, indeed greater proportionality than our current electoral system can provide. But the Justices have before them two clear cases of extreme partisan gerrymandering, each designed by the other political party. And they have a discernable and manageable standard, symmetry, which provides direction to how the problem might be remedied. We hope that all voters, regardless of partisan preference, are soon relieved of the very real discrimination that gerrymandering causes. And we hope that one day soon, party leaders will consider the electoral remedies available to them to advocate for greater political equality. Alex Keena is a Visiting Assistant Professor at the University of North Florida and will be joining the Department of Political Science at Virginia Commonwealth University in August 2018. His research focuses on political representation. 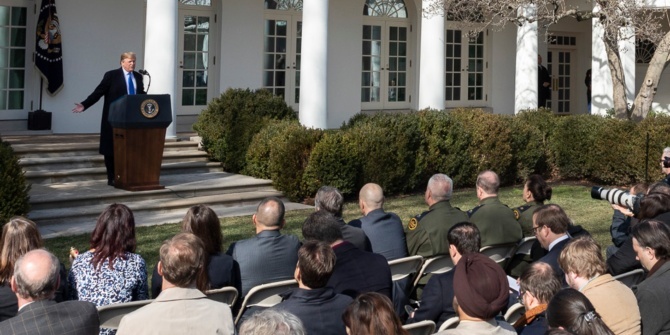 Michael Latner is associate professor of political science at California Polytechnic State University, and Kendall Voting Rights Fellow at the Union of Concerned Scientists. 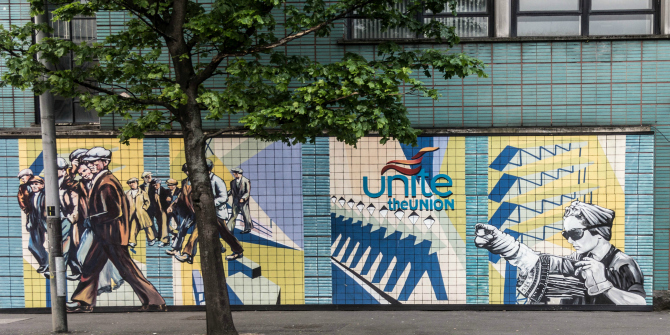 Anthony McGann is a Professor at the School of Government and Public Policy in at the University of Strathclyde. 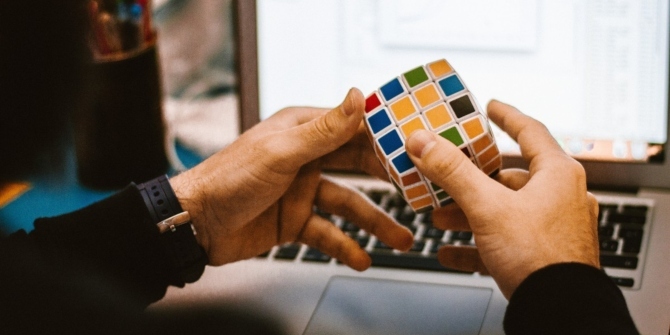 He is currently affiliated with the Institute for Mathematical Behavioral Sciences and the Center for the Study of Democracy at the University of California, Irvine. From 2008-2009 he was the co-director of the University of Essex Summer School in Social Science Data Analysis and Collection. Charles Anthony Smith is Professor and Associate Dean at the University of California-Irvine. His research is grounded in the American judiciary but encompasses work in both comparative and international frameworks using a variety of methodologies. The unifying theme of his research is how institutions and the strategic interaction of political actors relate to the contest over rights. He is the author of The Rise and Fall of War Crimes Trials: from Charles I to Bush II (Cambridge University Press 2012) and Gerrymandering in America: The House of Representatives, the Supreme Court, and the Future of Popular Sovereignty (with Anthony J. McGann, Michael Latner and Alex Keena, Cambridge University Press 2016) among other books. I am not sure that the solution to gerrymandering is to over-engineer districts to ensure “Democrat” or “republican” representation. Districts should represent people, not parties. Plus, there are a lot of people registered as independents. There are about 750,000 registered independents in MD, certainly enough for one seat. The answer may be for the Supreme Court to simply say that past voting behavior or party affiliation cannot be a criteria for redistricting. Period. Keep in mind, there is no real requirement that the House have a fixed number of seats. representation is now 1:750,000 people. It could be 1:100,000 people or 1:50,000 people. History buffs should read about “Article the First” a constitutional amendment that never got ratified. It would have set representation at around 1:50,000. Increasing the number of House seats would solve gerrymandering to a large degree. 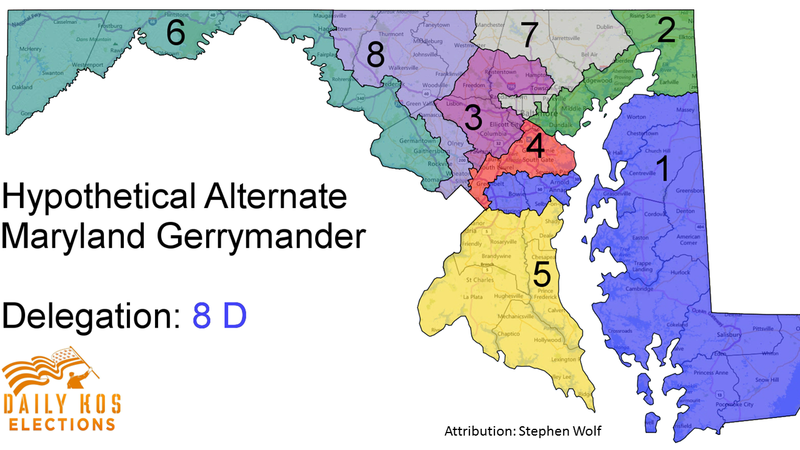 Regarding “symmetry” broadly considered, Figure 4 for Maryland shows two multimember districts with asymmetrical numbers of representatives (3 and 5). Why would this be preferable to two multimember districts of equal size (4)? And why this line between districts 1 and 2? Have you compared the racial compositions of the two districts, and do you think that any difference between the two would be immaterial? And generalizing from this case to states that are either larger or smaller, to what extent do you think the representative numbers in multimember districts should vary? For example, should CA have 15 districts of 3 and 2 of 4, 9 of 5 and two of 4, or one of the many mix and match alternatives in between these poles (e.g, 5*5+4*4+3*4)?